A book about projects created using the Raspberry Pi has been released, including details about how Erica was constructed. It’s available from Amazon. Erica will be at the Science and Engineering day 2016! Erica will be at Southampton’s Science and Engineering day on March 12th 2016! 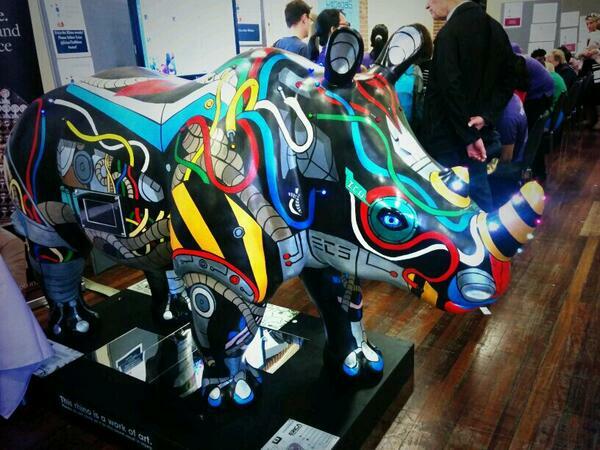 Erica made her second annual appearance at the University of Southampton’s Science and Engineering Day. 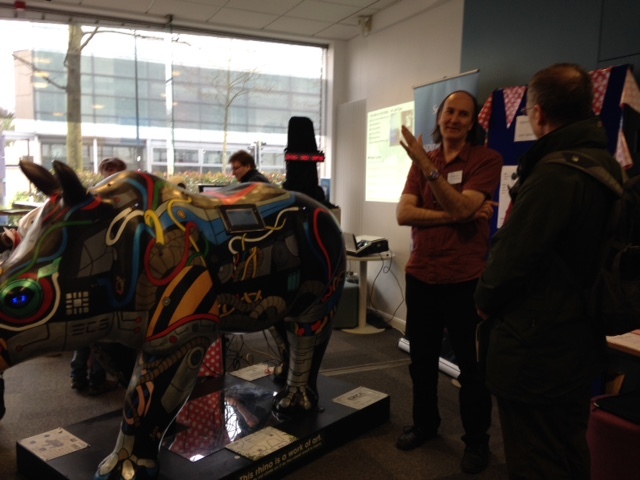 She was based in the Nightingale building along with loads of other demonstrations from Electronics and Computer Science (ECS) such as “How healthy is your house” and “The hive mind”. Around 350 kids and their families got to know Erica, pressing her cheek and chin sensors and being spotted by her eyes and presence sensor. They also interacted with Erica’s various touchscreens to make her react by waggling her ears, moving and blinking her eyes, flashing her lights (LEDs) and making various noises, including farting when she gets overfed. 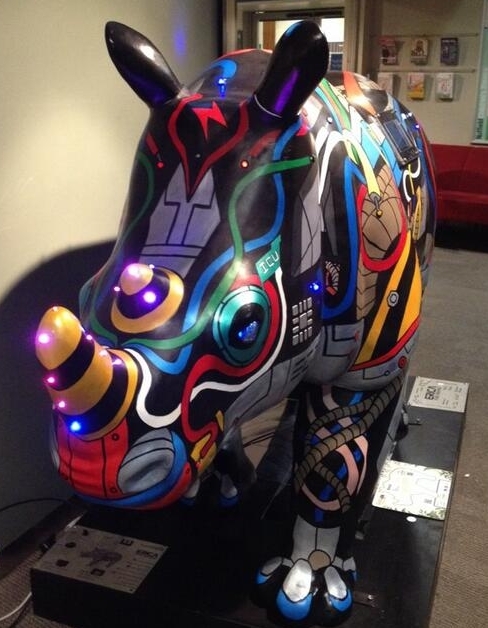 They could also use Twitter to tweet Erica to get her to change the colour of her horn LEDs. Although Erica has not acquired any significant new behaviours for the Science and Engineering Fair, she has been upgraded to use the new Raspberry Pi 2s, which are a lot more powerful than the original Raspberry Pis. 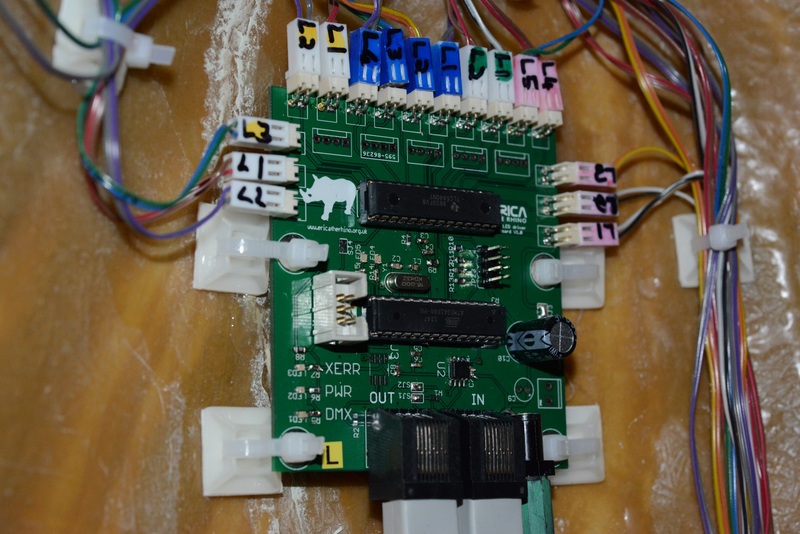 As mentioned in an earlier post, the boards that sit on the top of pis have been upgraded with proper bespoke printed circuit boards. The next post will go into a bit more detail about Erica’s upgrades made for this year’s Science and Engineering Fair. With the 2015 science and engineering family day fast approaching and the release of the new Raspberry Pi 2 Erica is to get a performance boost. With the additional processing power and memory on the new Pis, Erica will be able to do more and react faster. Further updates coming on that soon. 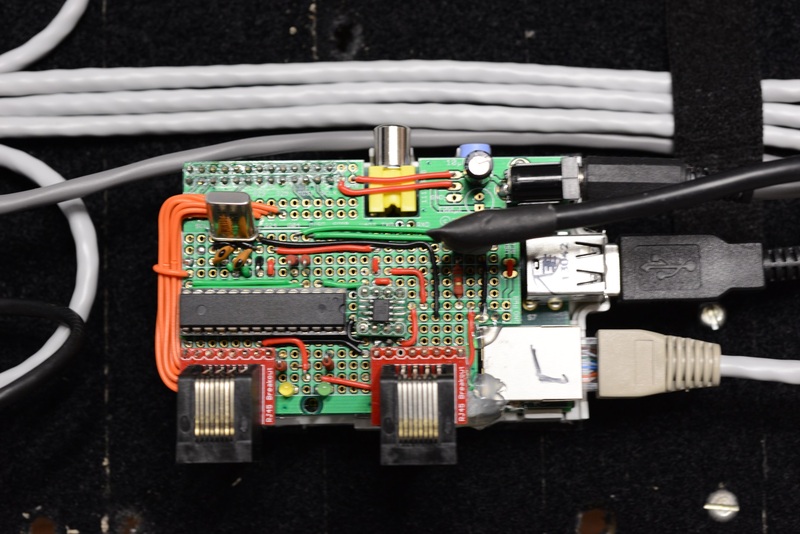 As the Pi B+ and Pi 2 have a new form factor, the original interfacing electronics built on Humble Pi prototyping boards no longer fit particularly well. To fix this we have created a Pi HAT (Hardware Attached on Top). This contains the electronics to interface between the pi and the rest of the electronics inside Erica. 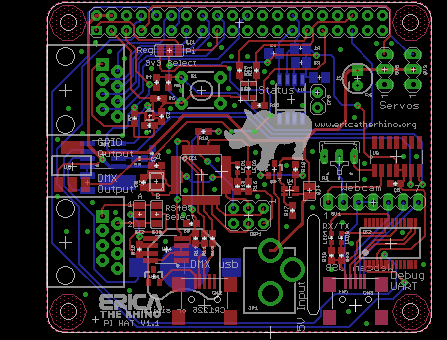 These new boards have been designed with all of Erica’s interfaces on a single board, we can then populate the sections of the board that are to be used on each Pi. We are also moving to surface mount components in order to fit all the interfaces into a space a fifth of the size, allowing for all the interfaces to be combined. As well as receiving the award pictured below, Erica herself won some prize money, allowing her to indulge in some treats and days out over the next year or so. As well as winning the VC award, back in June Erica was also a runner-up in the National Co-ordinating Centre for Public Engagement (NCCPE) Engage Competition, “Engaging with Young People” category. 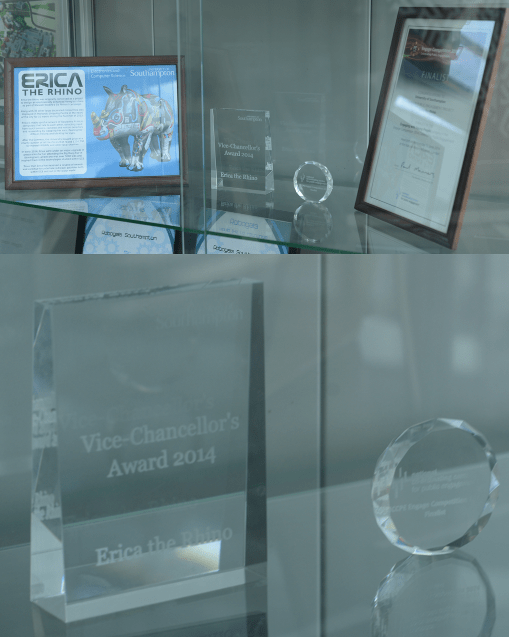 Although it was slightly disappointing not to win our category, Erica funding-wise was probably one of the smallest, if not the smallest, project across all of the categories, so being selected as a finalist was a big achievement in itself. One of the major upgrades to Erica before she went off to the Big Bang Fair was replacing her old side screens with interactive touch screens. 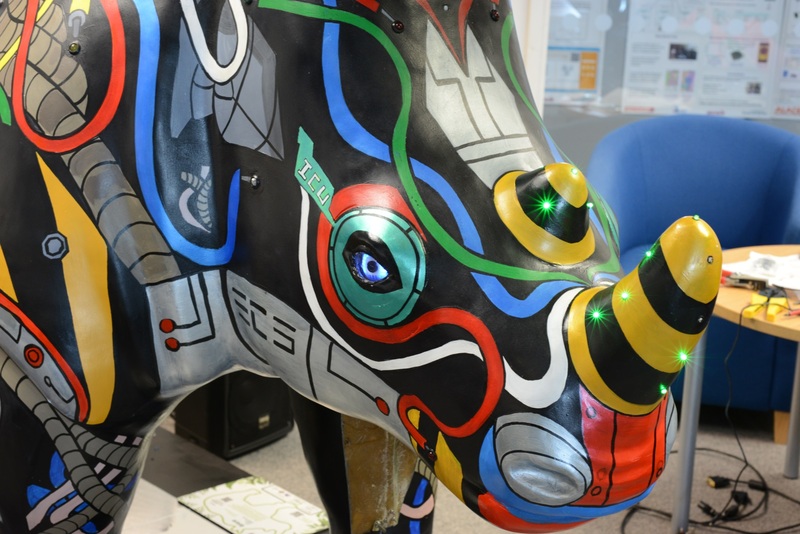 Interact with Erica: Press buttons to make her eyes move and blink, make her ears waggle, make her horn change colour and make here body lights flash on and off. See What Erica See from the video cameras in her eyes. Read Erica’s internal monologue, has anyone walked past or feed her recently, has she seen a face she recognised, has someone tweeted at her? Look at Erica’s mood: Is she hungry or happy, awake or bored? 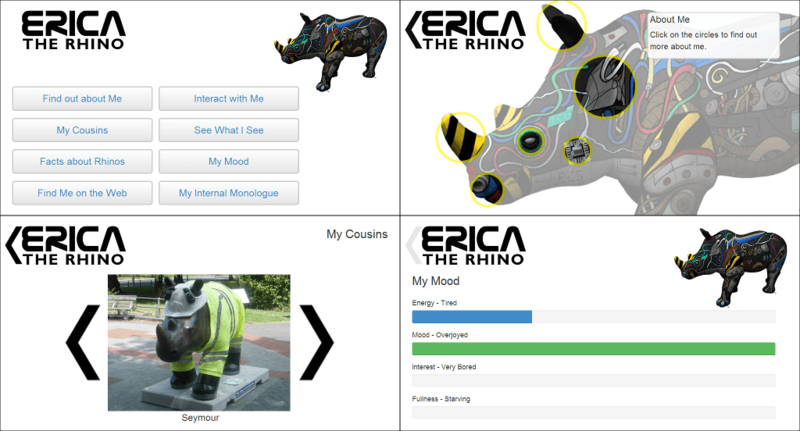 Flip through Erica’s photo-book of her cousins that were part of the GoRhinos! exhibition. Find out more about how you can interact with Erica. 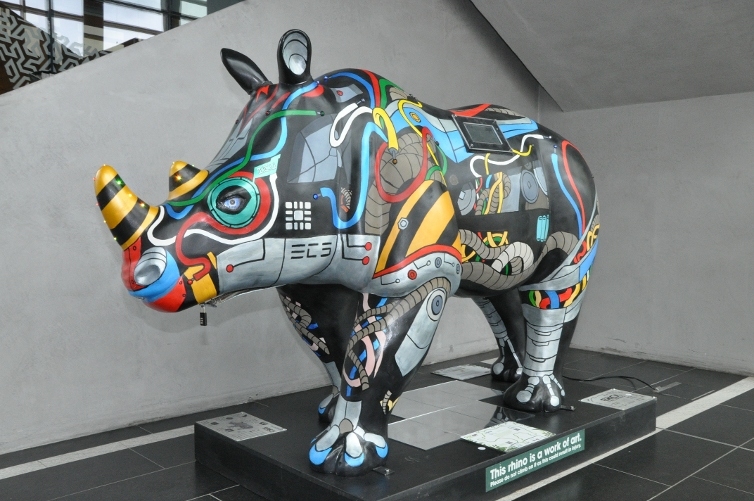 Read facts about rhinos in the wild. Get more information about Erica on the Web. For those of you interested in the technology. We bought some very cheap (£40) 7″ tablets that were running Android (Ice Cream Sandwich). We then installed a couple of apps to provide us with a full screen browser that could load our web pages and then a locking app to stop people from exiting our web pages and misusing the tablet. As mentioned in the earlier led post Erica has been given a LED upgrade. The boards have been soldered up and installed. 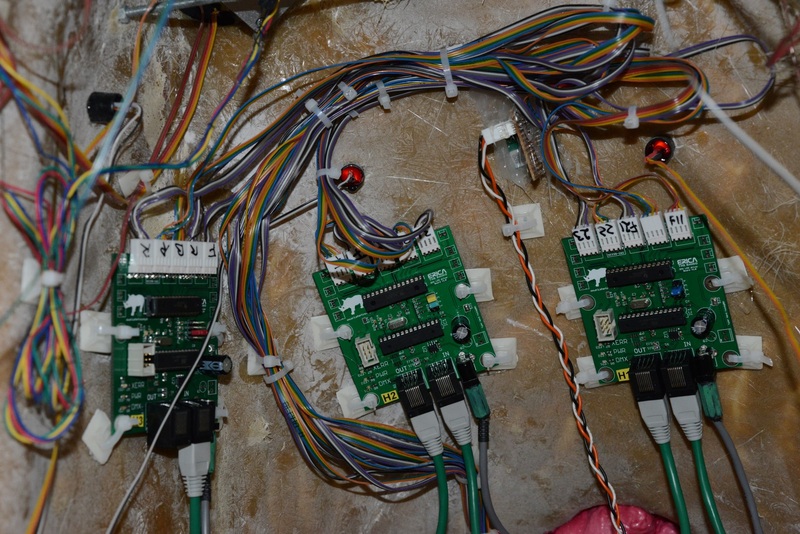 The boards where built in two versions the side controllers where equipped with connectors for the single channel leds whilst the ones in the horn where given connectors for the RGB leds. The original plan was to use the pi’s on board serial port to control the LEDs, but we where unable to get that to work, instead we built an opensource DMX transmitter we used the designs from udmx, however the code was for the atmega8 microcontroler that we didn’t have any of available to resolve this we ported the code over to the newer pin compatible atmega168 which we had used on the other boards. As a part of taking Erica to the big bang her plinth needed improving. The original version had a single captive mains cable to provide Erica with power. Although this was fine when Erica was in the Marlands we have since discovered several issues with this solution, as the cable was captive it was easily damaged when moving Erica around, in addition to this disconnecting Erica from the plinth for maintenance or transport was a difficult task. As well as power we wanted to connect other wired devices to Erica such as external speakers or displays. The difficult challenge when doing this is to ensure the plinth is still robust enough that it can survive being based around either in transport or things bashing into the plinth. In addition we wanted to make it easier to disconnect Erica from the plinth, this was especially important now that we where adding additional cables. In order to do this we used robust versions of standard data connections, these are commonly used in theatrical or industrial situations. 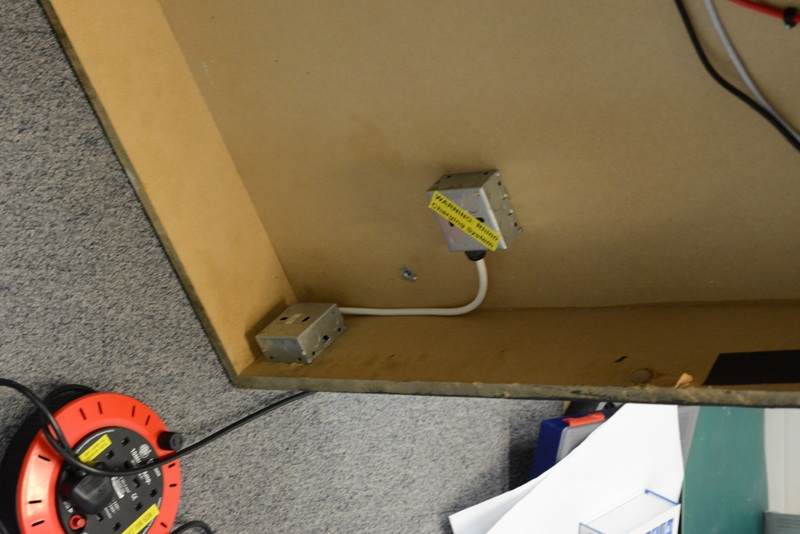 These connectors are usually available in a Neutrik D format housing which can fit into a range of different mounts , we chose to use standard wall plate sized mounts which we screwed onto the plinth. we had put a 4 slot plate under each foot and an 8 way for data and a 4 way for power on the back of the plinth. For the power connections we used Powercon connectors, as these are locking connectors it means that Erica wont loose power if someone pulls on the cable. 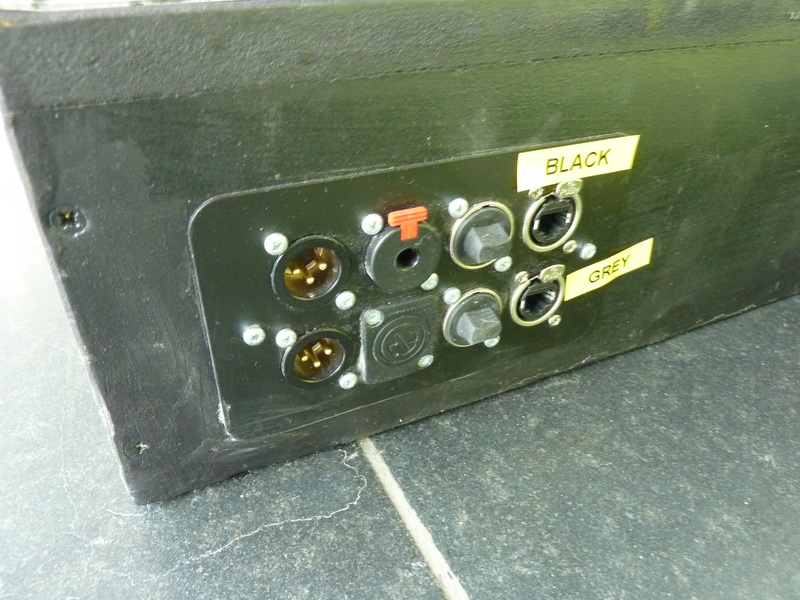 as well as linking the back plate to the foot plate we placed an additional out connector on the rear of the plinth to allow an extension lead to be plugged in to provide power for additional devices. For the data plate we had a mixture of data types to deal with. For the audio we used 1/4″ unbalanced stereo connections under Erica’s foot and on the rear of the plinth. 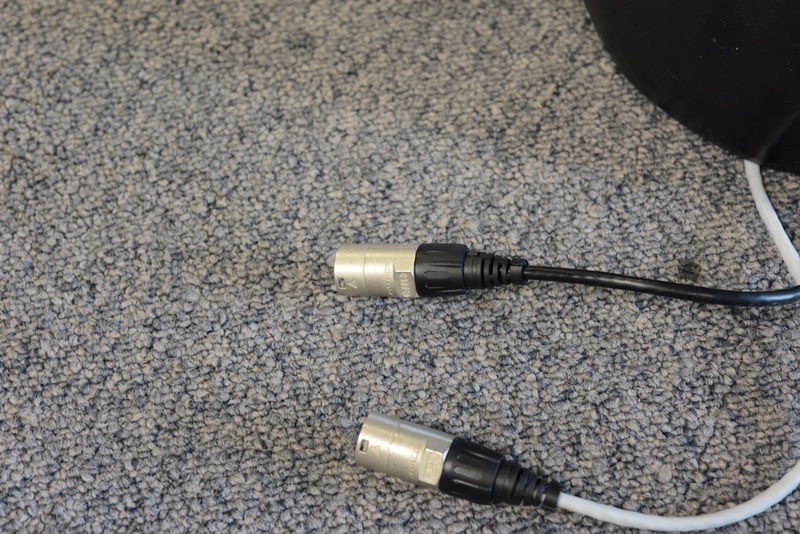 These where additionally broken out to balanced XLR connectors for direct connection to large speakers. For the Ethernet connections we used Ethercon connectors which as well as accepting standard Ethernet cables can also accept reinforced versions that protect the cable end by placing the connector inside a metal surround which can be released with the detach button rather than the usual locking tab. we did a similar technique for the usb and HDMI connections. After Erica’s recent trip to Birmingham for the Big Bang Fair, Erica has been back in Southampton but has only just had chance to set up in her new home in the Mountbatten building foyer. Over the weekend Erica’s attended the Science and Engineering Day on the Saturday and the TEDxSouthamptonUniversity event on the Sunday.